Fifty-plus mph on a double-decker pontoon with its own waterslide? Yes, please. 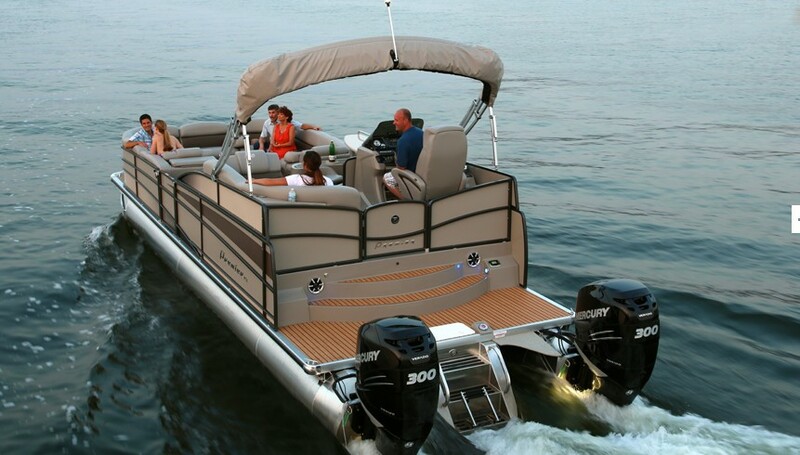 A testament to the exploding popularity of the pontoon boat market is the fact that I’ve been asked to run and review at least 20 of them in the last year alone. Whether it was in Miami, FL, Lake Wawasee, IN, or in Petoskey, MI, I’ve been aboard plenty of good ones, some not so good ones, and a few remarkably excellent ones. I’d like to tell you a little bit about the Premier 270 Sunsation Walk-On, a new model for Premier that I had the opportunity to run recently. It is one of the remarkably excellent ones. 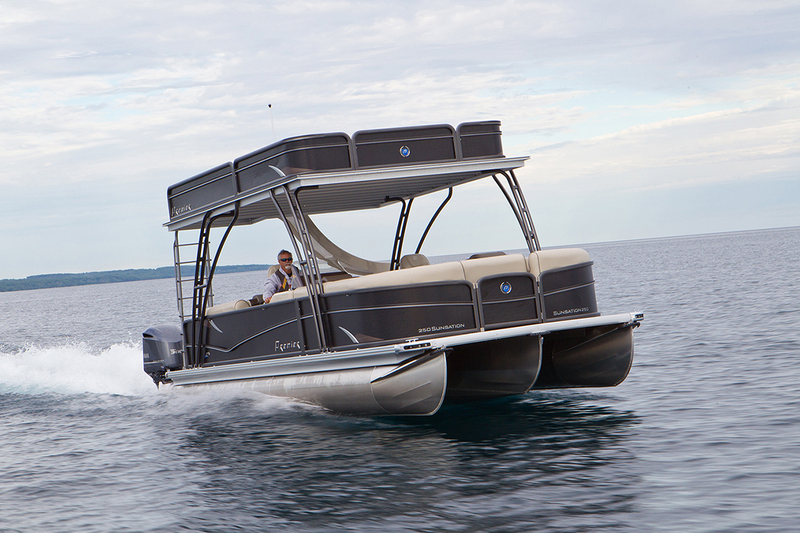 The Premier Sunsation 270 Walk-On blasts across Little Traverse Bay with two Yamaha F300s strapped to its stern. Premier has a solid and well-deserved reputation in the pontoon boat industry. Based in Wyoming, MN, since 1992, the company sports a lineup of pontoons ranging from to 18 to 31 feet in length. 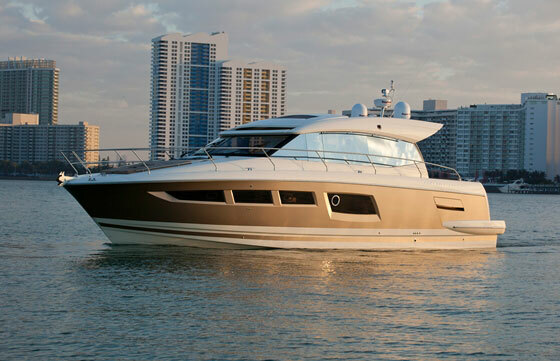 Premier’s boats are built to last, which means you’ll get a five-year, bow-to-stern warranty. In addition, the limited lifetime warranty covers decks, Bimini top frames and brackets, rotomolded furniture frames, and welding on rails, gates, and tubes. There’s even a five-year limited warranty on carpet, plus a seven-year limited warranty on Durasoft 7 vinyl. Premier also brings some very interesting innovations to the table. Among those innovations is Premier’s PTX tube system, which was on the Premier 270 Sunsation Walk-On. It works by adding a large center tube with a flat lower profile and beveled outer edges, and outer logs with lifting strakes, among other running surface enhancements. These log augmentations mean the 270 can carve turns and maneuver much like traditional V-bottom fiberglass boats. 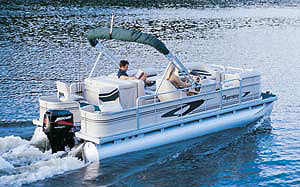 The upgraded tubes also allow the Sunsation 270 to carry more horsepower than base models—600 horsepower, in this case. So how well does this double-decked, waterslide-equipped party platform handle all those ponies, in reality? So deliciously well that I’m going to get right to the 270’s performance, something I normally save for last. It was a blustery day on Little Traverse Bay when I ran the Sunsation 270, but that didn’t stop me from pushing it to the limits. It’s not often that a pontoon boat throws you back into your seat, but lay down the hammer on the 270’s twin Yamaha F300s, and that’s exactly what happens. After the initial jolt, the pontoon accelerated quickly over the chop through 20, 30, and then 40 MPH, rushing all the way up to around 54 MPH at 6,000 rpm where the two engines consumed 50.7 GPH. Yes, that’s a lot of fuel, but it’s also not every day you can get a living room and an attached patio to go nearly 55 MPH across the water, either. A decent cruise speed for this setup is around 30 MPH, where fuel burn settles down to the 16 GPH area. That will give you a respectable theoretical cruising range of around 152 miles, with the 80-gallon fuel tank. Going fast is one thing, but handling that power gracefully is another story entirely. And in that category, the Sunsation 270 is a stunner. Despite the steep, two-foot chop on the bay that day, the Premier rep begged me to abuse the 270. So I did. I put the tall and wide pontoon into a series of figure-eight turns, high-speed cutaways, and tight circles—all maneuvers that can challenge even the best pontoon boats. Despite my efforts to get a pontoon log to slip, or grab and pull the 270 out of a turn, I simply couldn’t make the boat behave badly. 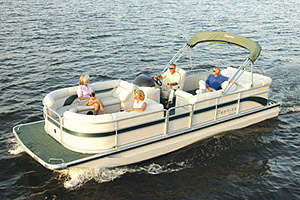 Now, it certainly doesn’t mean that this boat handles as well as a smaller, shorter pontoon with judicious horsepower. 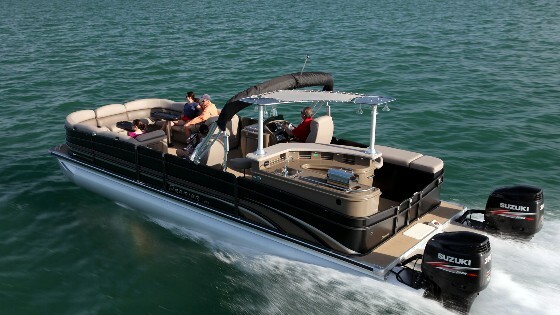 But for a nearly 30-foot long, two-story, 10-foot wide boat such as this, its handling qualities are exemplary. 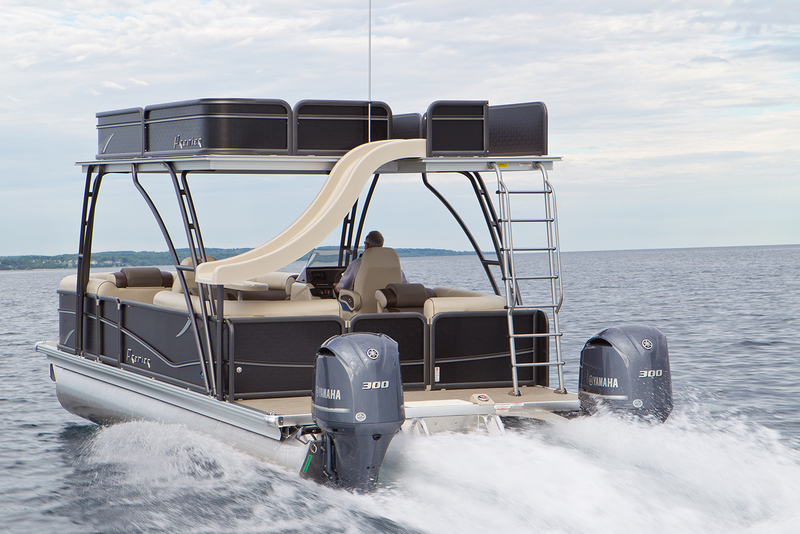 Paired with Premier's triple-tube PTX performance system, these twin Yamaha F300s can push the Premier Sunsation 270 Walk-On to nearly 55 MPH. You’re probably wondering about the joystick system I mentioned earlier; let’s talk about that next. Anyone who has boated with me knows that I am not a huge fan of joystick steering on twin-engine boats under about 30 feet in length. Maybe it’s because I’ve always felt as if I had better control in manually manipulating each engine, or maybe it’s because, as my nephews like to put it, “You stink at video games, Uncle Gary.” Well, Yamaha’s installation of its Helm Master joystick system on the Sunsation 270 changed my mind—at least on pontoon boats. When we got back into the small-craft harbor at Petoskey, I took a good 20 minutes to maneuver the boat around tight areas both with the joystick and by using the two engines to twist and turn the boat. Spinning a boat like this on its axis with twin engines is a breeze; you don’t need a joystick for that. But when it comes to going sideways, or on a tangent off that axis, the Helm Master system will generally outperform even the most seasoned skipper. It’s so good that I wouldn’t order this boat without it. It simply makes the boat a joy to use in tight quarters. That said, using the joystick does take some getting used to. But after five or so minutes I was a pro. Once back in her slip, I found Premier paid attention to all the right spots on deck. My test boat had what I call the “lounge-heavy” layout, which consisted of two forward-oriented, L-shaped lounges, two of the same sort in the aft section, and two captain’s chairs amidships, one for the skipper at the helm. A wide ladder on the starboard aft quarter accesses the upper deck and waterslide. The slide is even made slippery by its own dedicated water supply. I liked the removable bow and stern “seats” which can be moved out of the way for foredeck and stern access, or put back into place for form large, single-piece U-shaped lounges. It makes the layout more modular. A pop-up changing station is located under the forward port chaise lounge, and like on most pontoon boats, it takes as many arms as an octopus to put away correctly, because the cloth privacy screen constantly wants to billow out. One thing you may want to consider if you plan on entertaining a lot of people on this boat is an available sink/mini galley module, which the Premier rep told me is available by custom order. Otherwise you’ll be prepping sandwiches and drinks atop a cooler, which may harsh your happy hour mellow. The Sunsation 270’s helm unit and console are made of a single piece of custom-molded fiberglass that’s raised a bit to provide better visibility fore and aft. The helm and dash are nicely laid out and rich-feeling, with stitched leather trim and faux carbon fiber accents. Notable is the lack of gauges and dials, thanks to Premier’s Beacon System. It’s a touch-panel display that integrates GPS, engine stats, stereo, and other functions into a single, easy-to-read unit. While it may seem gimmicky, I found the system to be intuitive, easy-to-use, and a great way to keep up with the boat’s systems. A heads-up indicator even pops up when you trim the outboards at speed. Other running data, including joystick input information, is available via the Helm Master display unit on the starboard side of the dash. It all works very nicely. My only quibble about the helm area is how far aft on the starboard leaning rail the joystick is mounted; I felt as if I had to bend myself unnaturally to use it. Otherwise all other control placement is easy-to-reach and comfortable. So, what would I change if this were my boat? The seat bases are industry-standard rotomolded PVC, and for a pontoon of this caliber, I sort of expected to see more fiberglass. Also, I wasn’t a huge fan of the seat-bottom hinges, which make or break how easy it is to access stowage on a pontoon boat. They’re not the worst I’ve seen, but they’re not as good as those seen on some other top-shelf pontoons. Lastly, while the whole boat felt sturdy, the upper deck did sway and creak a tiny bit underway. As I walked up the dock and wrapped up the day, I looked back down at the Sunsation 270 Walk-On and a brain cell tickled me with this notion: “Did I just go nearly 55 mph on a double-decker pontoon boat with a waterslide and joystick docking controls?” I didn’t need to pinch myself; the Premier 270 Sunsation Walk-On is real, and a worthy contender for your pontoon dollars. Other Choices: Two other large pontoon boats with twin outboard power worth considering include the Bennington 30 Club Twin and the Premier 290 Grand Entertainer. 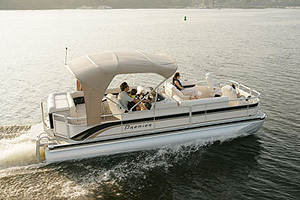 View Premier Sunsation pontoon boat listings. Test conditions: calm seas, winds 5-10 knots, 2 POB. Performance data courtesy of Yamaha. Power Twin Yamaha F300 four-stroke outboards, swinging two 15.25" x 18" three-bladed stainless-steel props.